Famous people born on March 17 are exceptional. As a Pisces, they have a special gift and may learn their purpose in life early on. As a matter of fact, they may have lived before if they believe in reincarnation and things of that nature. 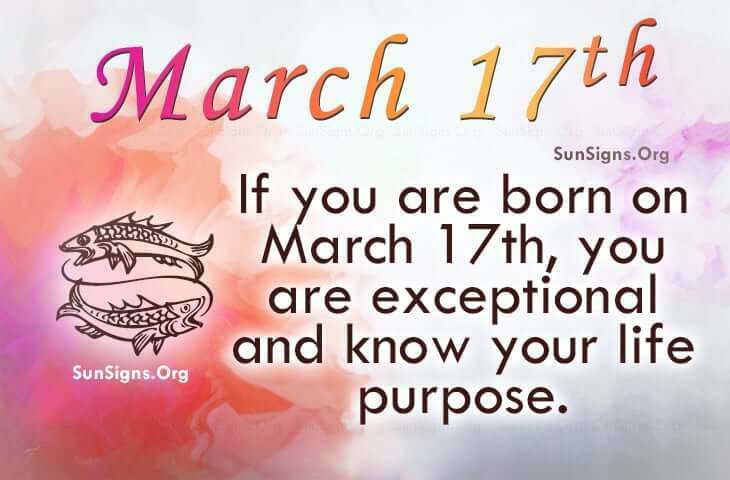 If you share your birthday with famous March 17th born people, then like them you should seek the experts for advice and tools to discover your own talents and psychic gifts. They look to their friends and family for support and guidance. Their career is important as well. But without somebody to love and to share the significant points in life with, there seems to be something amiss. As a friend and lover, famous people born on March 17 tend to form relationships that are long lasting and conventional. Looking at their diet plan, it does away with candy and sodas. Those born on this day should take their vitamins as they may be prone to a vitamin defect which can throw them off balance. Famous celebrity birthdays of March 17th are listed below. But if you too are born on March 17, you could be a Pisces that is restless, adaptable and motivated. The March 17 famous birthday astrology predicts that they spend more time with their family and romantic interest. However, they want to live a lavish lifestyle and know that work is the way to achieve this status.